This special issue is based on a selection of papers presented at the 40th anniversary Policy & Politics conference, held in Bristol in 2012. Policy & Politics published its first issue in 1972 and since then has been one of the leading international journals in the field of public and social policy. In that time the nature of policy and politics has undoubtedly witnessed significant transformations. Recent changes have included the increasing importance of global governance, a reframing of the state in delivering public services, the global economic downturn and associated austerity measures.This has been combined with rising public expectations about choice and quality of public services and the transition from government to governance, epitomised by the inclusion of non-state actors in the policy process. The 40th anniversary year provided an opportunity to reflect on these developments and the impact they have had on the field of policy studies and the world of practice. It has also been an opportunity for the journal to consider its position within and contribution to the field. A host of leading international scholars were invited to present papers on the conference theme: 40 Years of Policy & Politics: Critical Reflections and Strategies for the Future. Delegates examined contemporary policy issues while looking back at the experiences of the last 40 years and reflected on how much is enduring, what has changed and how we might use past lessons to inform future policy? 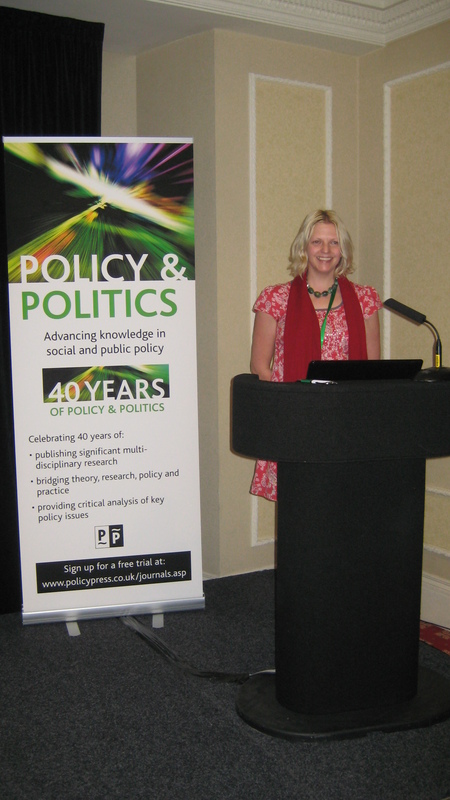 The conference included themes where Policy & Politics has enjoyed a strong track record in publishing world class scholarship, including democracy and social justice, partnership working and governance, politics and discourse, theories of policy making and reflections on health, housing, welfare and education policy. This special issue presents a selection of articles drawn from the conference. It brings together work by world leading scholars to address theoretical and practical developments pertinent to Policy & Politics over its 40-year history. It begins with an article by Christopher Pollitt, who argues that ‘despite the UK’s leading role in public management reform, and decades of continuous change, little has been learned of the final outcomes’ (p 465). Pollitt ascribes this to the methodological limitations in evaluating major management reforms – that is, the difficulty in using orthodox, ex ante performance indicators in complex and constantly changing policy environments – and an apparent disinterest within government for finding out the results. Pollitt also notes the apparent ease with which large-scale reform takes place in the UK. This is the consequence, he argues, of a ‘light touch’ legal system and a style of politics which enable leaders to instigate public reform unchallenged. While the UK may have a leading role as a major exporter of public management ideas, Pollitt asserts that ‘its prominence has been built upon shaky foundations’ (p 466). Rod Rhodes joins Pollitt in raising questions about the production and quality of social science evidence to inform policy and practice. He considers the limitations of the dominant tradition of modernist empiricism in political science with its roots in the natural science model, and asks what lessons about public sector reform can be learnt from using political anthropology: more specifically, whether the various reform proposals introduced in the UK blend with the everyday beliefs and practices of Whitehall civil servants and their ministers. Rhodes uses the concept of ‘storytelling’ to examine the structures and procedures that guide working practices in Whitehall. He argues that would-be reformers would benefit from drawing on observational evidence so that they know ‘what they are seeking to reform’ (page 492). These insights, he argues, would be more effective than the rational, managerial approaches to reform that have predominated since the 1970s and produced modest success. Jonathan Davies also refers to the importance of everyday behaviours and working practices in his critique of the continued dominance of the neoliberal narrative and quest for possible alternatives. He refers to the concept of ‘everyday making’ to explore the possibilities for resistance and change within the capitalist system. Everyday makers reject system-orientated theories and campaigns and instead look to invoke opposition by deciding ‘in the first place, to act differently’ (page 497). However, Davies rejects the idea that we need to choose between everyday and systemic approaches, and instead argues that they are complementary. He argues that a future challenge will be to grasp the ‘dynamics of scale: the systemic implications of everyday struggles and vice versa’ (page 497). Janet Newman echoes Davies’ call for the exploration of creative and progressive responses to the politics of austerity. She considers ‘how actors with “progressive” social or political commitments are able to enact new worlds within the confines of the [neoliberal] present’ (page 515). Newman argues that critical reflections alone are insufficient, and goes on to explore the potential for new methods, actors and framing of the policy process to generate innovatory solutions in a period of cuts and austerity. Both Newman and Davies recognise the importance of the individual (or agency) in exploring new pathways to post-austerity politics, as do Vivien Lowndes and Kerry McCaughie (533-49) in their analysis of local government in the UK. They identify the emergence of creative responses to service redesign, based upon pragmatic politics and ‘institutional bricolage’ – the recombination and reshuffling of preexisting components to serve new purposes. Lowndes and McCaughie agree with Davies and Newman in their observation of an apparent absence of radical new ideas in austerity politics. Instead, they observe new solutions emanating ‘bottom-up’ as practitioners take the role of innovators and entrepreneurs in their daily practices. Martijn van der Steen, Mark van Twist, Menno Fenger and Sara Le Cointre (551-67) also examine the role of contextual factors, local circumstances and practitioners in shaping policy outcomes. More specifically, they examine the unintended effects of policy interventions in ‘weak schools’ in the Netherlands. Their article poses two central questions: What causes the differences in outcomes of similar policies in similar contexts? Can patterns of causation be found in what seem to be unpredictable, unstable and chaotic systems? They look at the role of causality, feedback mechanisms and cyclical loops in the production of policy outcomes. They view cumulative effects as inevitable and hence predictable. Like other articles in this issue, they recognise the central role of local practitioners in predicting and identifying the local circumstances and causations that might impact on policy outcomes in unique ways. Other articles have explored the complex relationship between different modes of governance – markets, hierarchies, networks – in the policy process. Guy Peters examines the challenges of policy coordination in different contexts. Peters claims that hierarchical coordination is the ‘default option for coordination’ (page 580), but that it can be analysed in different ways. One is to understand coordination as a collective action problem based on an analysis of self-interest and resource dependency. Another is to view coordination as a form of cooperation and collaboration, whereby coordination is not based so much on rational calculation but on perceived needs to work together and shared beliefs. He goes on to explore the conditions and factors where these alternatives are most likely to be successful. Likewise, Steve Martin and Valeria Guarneros-Meza consider the dynamics of hierarchy and coordination in their study of local partnership working. They explore the kinds of ‘self-steering’ required in order to address complex public policy problems and whether external (hierarchical) steering by government can help or hinder the process. They conclude that ‘soft steering’ – defined as the provision of government funding, information and expertise’ – can have ‘an important role in helping to establish and mobilise the local partnerships’ (page 586) but that self-steering capacity is also vital. These examples illustrate the continued presence of hierarchy within the so-called transition to networked governance and, interestingly, the potential complementarity of governance modes in the right context. Peter John’s work on the ‘tools of government’ looks at the scientific developments that have taken place in the field over the past 40 years. John argues that the traditional tools of government, such as legislation, finance and regulation, are being redesigned or supplemented by low cost behavioural interventions, such as ‘nudge’. Nudge involves using information in a particular way that encourages citizens to behave in their own or society’s interest. John notes that the tools of government have always had an informational component, but that they ‘are more informational now because of a growing awareness among policy makers about the power of signals and norms’ (page 606). John’s work provides a powerful demonstration of the impact of new methodological and scientific techniques on the policy process. A number of articles in this issue have raised questions about the type of knowledge and evidence produced by social scientists, and its variable impact on policy (Flinders, 2013; Pollitt, 2013; Rhodes, 2013). In particular, Matthew Flinders reflects on how the academy should engage with policy and practice. He calls for ‘engaged scholarship’, and for academics to realise their ‘political imagination’ to ensure that academic knowledge has a clear role in ‘promoting public debate, cultivating engaged citizenship and having some form of impact beyond academe’ (page 626). He challenges the academy to reconnect with policy and politics and to embark on a different type of scholarship that is more accessible. Aside from meeting a public duty, he argues that this will be essential to the reputation and survival of political studies as a discipline. There are obvious connections in the themes covered in this collection of articles. The content represents key contours of the terrain covered by Policy & Politics over the last 40 years. In the final article, Sarah Ayres and Alex Marsh reflect on the theoretical and practical developments pertinent to Policy & Politics during this period, and suggest some steps to advance the debate. We draw out key themes from the papers comprising this 40th anniversary special issue and discuss them under four headings: (1) theorising policy, (2) evidence and the policy process, (3) transforming structures and processes, and (4) implementation and practice. We argue for ‘greater tolerance of diversity in theoretical and empirical enquiry and for continued reflection on the foundational assumptions of the field of policy studies’ (page 643). Finally, I would like to offer some reflections on the future of Policy & Politics as it embarks on the next 40 years. Matthew Flinders and I took over as co-editors of Policy & Politics in its 40th anniversary year. It has been, for us, a period of critical reflection and thinking about strategies for the future. We have revised our editorial strategy to reflect the unique intellectual landscape of the journal. The vision and strategy of Policy & Politics is to publish articles that demonstrate rigour, originality and significance, and that have relevance both within and beyond academe. This focus has forged its position as a truly interdisciplinary and international journal over the past 40 years. However, like all journals, Policy & Politics must evolve to retain its capacity for examining new trends, debates and challenges. The current journal strategy embraces two dimensions of scholarship – continuity and change, on the one hand, and breadth and depth, on the other. In terms of continuity, Policy & Politics continues to foster its intellectual reputation as an outlet for world-class scholarship in relation to public administration, public and social policy, partnership and community governance, and public sector reform. In terms of change, the journal is increasingly publishing influential articles in relation to citizenship and the state, public participation and the relationships between evolving structures of multi-level governance, and mechanisms of democratic accountability. We welcome the submission of manuscripts that build upon the journal’s traditional strengths, as well as those that push the journal into new intellectual debates and terrains. Within a broad disciplinary landscape, the underlying factors that will determine publication are whether the manuscript meets the journal’s standards in terms of rigour, originality and significance. In terms of breadth and depth – the journal welcomes manuscripts that are empirical, conceptual or theoretical, as long as the broader international and comparative relevance of the argument is explicit. One of the hallmarks of the journal is the manner in which its articles generally shift from the micro to the macro (or vice versa), by addressing the link between ‘policy’ and ‘politics’. For example, while singlecase studies might form the basis of an article, the broader significance and relevance of that study will be made explicit. Where articles deal with broad macro-political or economic issues they may also drill down to some discussion of the micro-level implications of that analysis. Successful articles will therefore demonstrate both analytical breadth and depth in the coverage of their subject matter. Articles also need to be written in a manner accessible to academic scholars, policy makers and practitioners across different academic disciplines around the world. This focus will shape the direction of the journal at least for our term of editorship. Policy & Politics welcomes this challenge and has a commitment to remaining reflexive, open minded and responsive to trends while being proactive in setting research agendas.